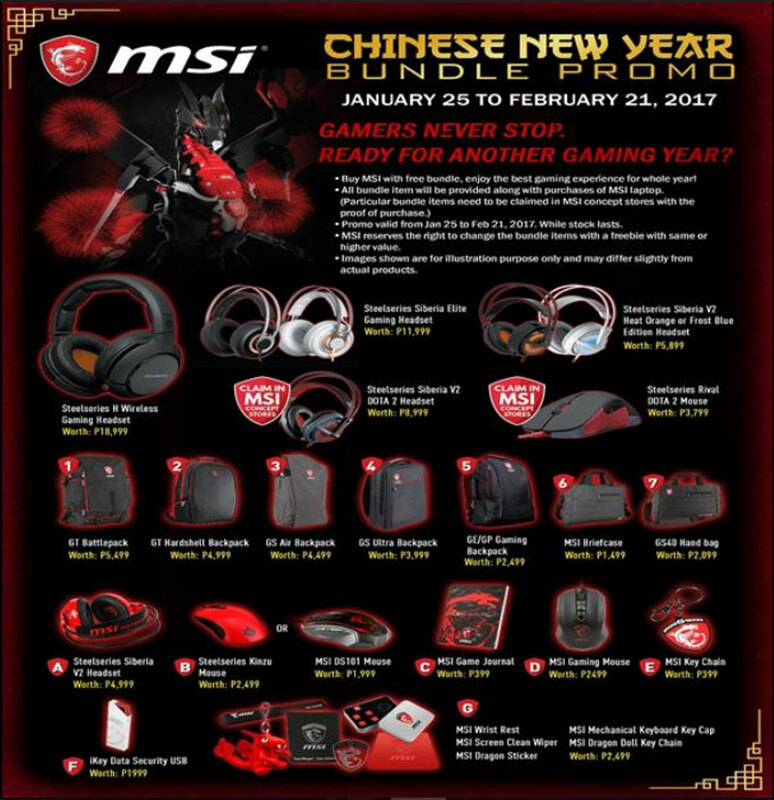 MSI Philippines Notebook has once again released another promotion, this time coinciding with Chinese New Year. 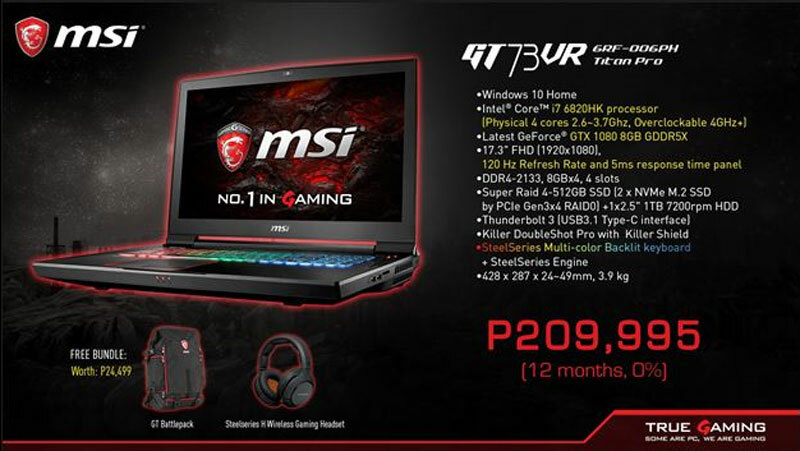 Buy your MSI gaming notebook between January 25 – February 21, and get awesome freebies such as SteelSeries headsets, SteelSeries mouse and other MSI products with each respective model. With 1x M.2 interface, the latest PCI-E Gen 3.0 x4 bandwidth utilizing NVMe technology on single M.2 SSD. Harness the full performance potential of the Gen 3.0 SSD outputting extreme read speeds up to 2200MB/s, 4x faster than SATA3 SSD’s. Or optional the M.2 SATA3 SSD to get over 500MB/s access speed. Get the best possible performance out of your notebook with support of the advanced DDR4-2133 memory, achieving over 29GB/s in reading speed and 32GB/s in writing. With over 30% faster performance than previous generations DDR3-1600. Dragon Center provides six functions to get a total control of your GE series notebooks, easy access to all apps at once (App Portal), real-time system performance monitor (System Monitor), adjust LED effect (LED Wizard), parameter adjustments in VR Ready /Fans speed / true color profiles / SHIFT in just one click, monitor and adjust system profile, Dragon Center empowers users to facilitate tweaking process without occupying system resources. "Nahimic 2+ 3D virtual surround sound - "I see your sound"
Nahimic 2+ Audio Enhancer specializes in 3D virtual surround sound processing and audio improvement. Moreover, Nahimic eliminates background noise, thus, enhances clarity of dialogues during conversations. The special function, Sound Tracker, introduced in Nahimic 2, permits gamers to ""see the direction of and distance from the enemy's sound"". True speakers designed by the world’s leading speaker manufacturer Dynaudio are embedded onto MSI Gaming laptops. Dynaudio delivers an authentic sound experience by boosting power amplitude 50% more than the previous generation, meaning a volume increase over 10~15dBA. 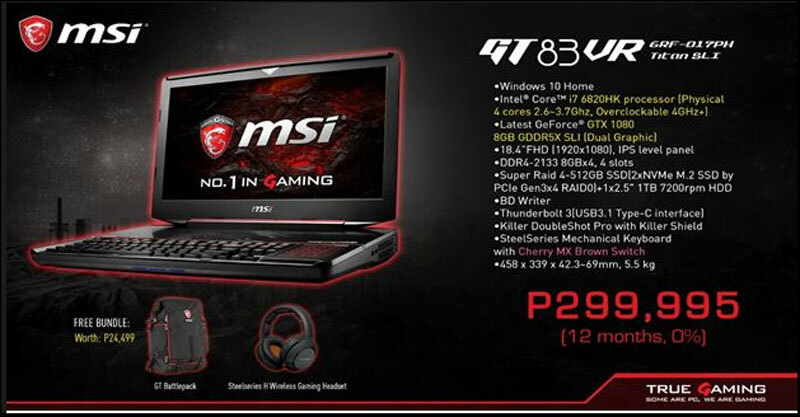 The MSI Audio Boost 2 design enhances the output sound detail and sound stage by 30% more. The golden flash audio jack provides stable sound transmission and works in conjunction with the optimized headsets AMP design, greatly enhance headphone performance and faithfully reproduce each acoustic detail. Besides a 5ms response time, the 17.3” 120 Hz refresh rate panel produces up to 120 individual picture frames per second. The 94%NTSC wide color range brings more glossy red and blue colors for advanced gamers with their eagle eyes. *Besides 100%sRGB Mode, True Color Technology also offers prefect color accuracy for 5 more scenarios. MSI innovative Matrix Display supports up to 2 external displays simultaneously through 1x HDMI port*, 1x Thunderbolt 3, and 1x Mini DisplayPort 1.2. Multi-task is possible during competitive gameplays. Matrix Display supports 4K output with a resolution up to 3840 x 2160 @60Hz. Matrix Display technology creates an ideal environment for extreme gaming experience and pleasant multimedia. Killer E2500 series chipset protects networking traffic and prevents lag spikes so you can game without fear and play at your best while tracking your speeds with the easy-to-use Killer Networking Manager.